Whenever I visit a place where I used to live, I try to dine in a combination of places I’ve never been and places I dreadfully miss having just down the road. On a visit to Boston this summer, I just couldn’t resist the allure of some of my favorite old haunts. In the same way I visited old friends and walked slowly through familiar neighborhoods, I spent most of my dining time savoring dishes in places I often frequented when I lived in the city. 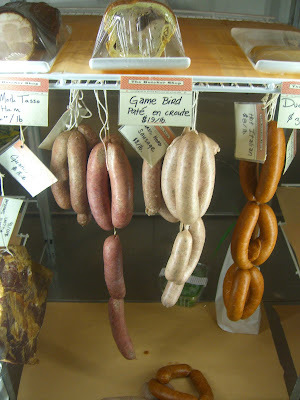 There was one notable exception to this pattern, so I’ll tell you first about dinner at The Butcher Shop. This little wine bar/ deli/ restaurant/ butcher shop is located on Tremont Street, in the heart of the hip and happenin’ South End – my favorite neighborhood in Boston. I lived just up the street for a couple years, so perhaps I’m biased, but it really is one of the loveliest, Bostoniest areas of the city. 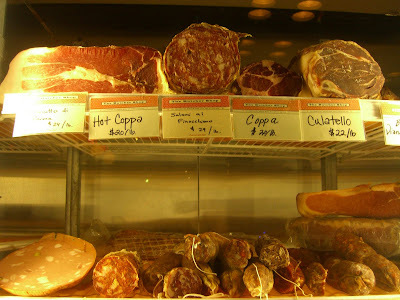 My good friends Amy and John suggested The Butcher Shop for its impeccable wine list. As soon as I entered the place, I forgot about drinking and headed straight for the coolers in the back of the room. And I stood there, transfixed and nearly drooling, until one of the staff came over to check on me. 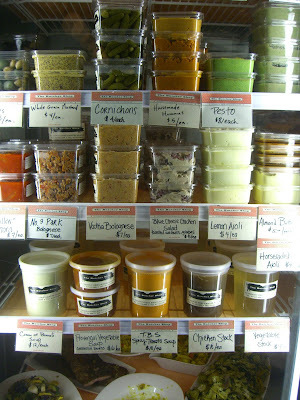 Soups, sauces, salads, stocks. Pate, sausages. Coppa, culatello. Good thing Amy and John support my food dorkiness more than just about anyone, cuz it was a good ten minutes before I pulled myself away from these goodies and joined them for a glass of wine. I remember having a very nice rose cuvee followed by a Rioja produced especially for the restaurant. 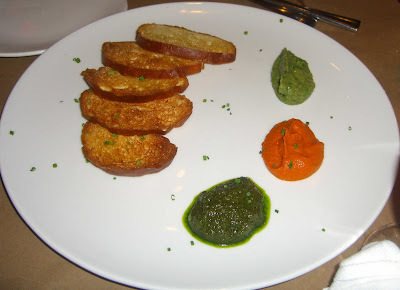 We started by trying a few of the housemade sauces with crostini: basil pesto, bean puree, and romesco. John’s NY strip was the clear winner of the evening. It was tender, aged well and had a very intense, beefy flavor. Next time I’m at the Butcher Shop, I’m ordering the steak. 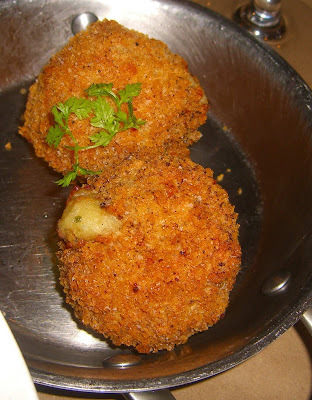 It came with potato croquettes. 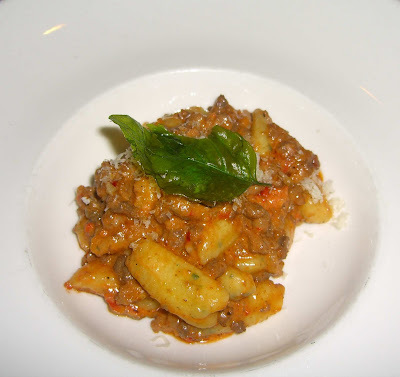 Amy’s ricotta gnudi with bolognese was very rich and deceptively filling. 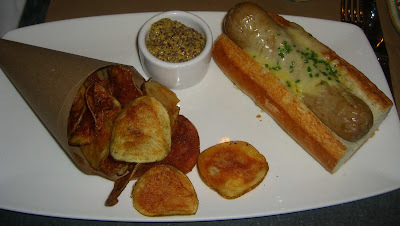 And I, inspired by the sausage display at the back of the house, ordered a hot dog a la maison. This was no ordinary rubbery hotdog. It was juicy and salty, topped with comte cheese and chives, nestled into a buttered roll and served with whole grain mustard. The accompanying house made rosemary potato chips were also excellent. 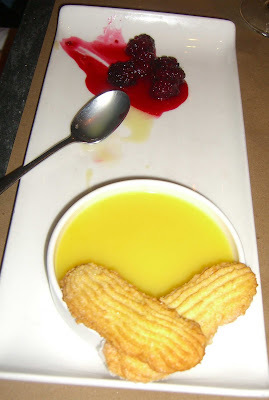 We ended with a lemon curd dessert with crumiri cookie and blackberries. None of us was super impressed – next time, I’ll spend my money on a big charcuterie appetizer platter instead and pop in for a pastry or ice cream at one of the bakeries in the area. 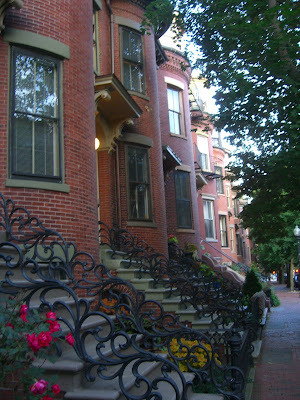 I also used to spend a lot of time in beautiful Back Bay. 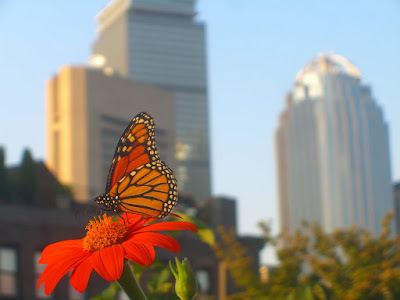 I was lucky to live right on the Southwest Corridor, a well-kept park running above the orange line subway, so a walk to Copley Square from my place in the South End was a quick 10-minute stroll. My best college buddy Jackie lived in Back Bay and I would often come to her ‘hood for lunch or after-work drinks. 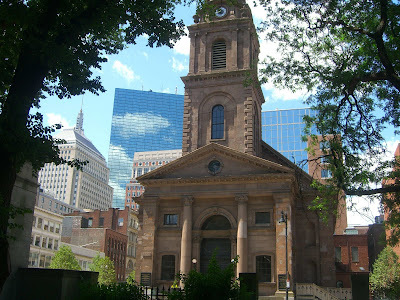 Her favorite spot, especially when the weather is nice, is the Parish Café on Boylston. It has a spacious outdoor deck and is a street over from all the hustle and bustle of Newbury Street. During this visit, the menu was featuring dishes created by a number of Boston chefs. I chose the Flour B.L.T. created by Joanne Chang, chef/owner of Flour. I love B.L.T.s, and this one was a winner with plenty of herby mayonnaise and a side of my favorite Cape Cod potato chips. 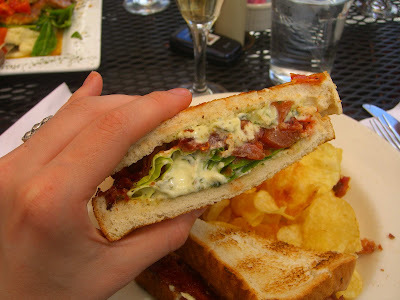 Applewood smoked bacon, Boston lettuce and oven roasted tomatoes served on Texas toast with basil-mayo. My sis-in-law Meg got Sean’s Simple Chicken, breaded chicken cutlets sauteed in chicken stock, olive oil, lemon, parsley, and garlic with diced tomatoes and capers. 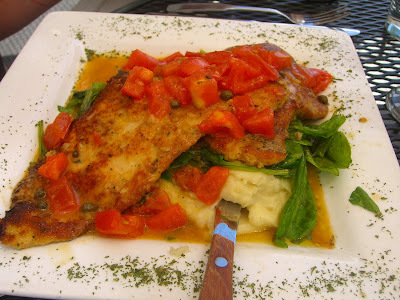 Served over garlic mashed potatoes and baby spinach drizzled with balsamic vinegar and olive oil. It was massive – she could barely finish half of it. After a leisurely lunch and some afternoon shopping, we stopped by the Rattlesnake for drinks and a snack. Also in Back Bay, the Rattlesnake offers one of the neighborhood’s only roof decks, so we often found ourselves here on nice evenings. Jackie bit off a bit more than she could chew with a big flask of white sangria, and I went with one of my fave beers, Chimay blue. 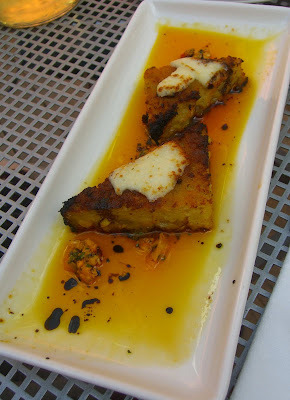 We also munched on grilled green chile cornbread with hatch chiles, Guadalajara butter and cotija cheese. I think this was the first time I actually ordered food at the Rattlesnake, and it was surprisingly good. I used to work in Central Square in Cambridge, and I often miss the huge choice of ethnic eateries in the area. Takeaway from The Middle East was a favorite of mine, and I met some old colleagues there for an outdoor lunch on Mass Ave. My go-to quick lunch used to be a falafel sandwich with hummus and veggies, but for this more relaxed occasion I opted for the pumpkin kibby (that’s how it’s spelled on the Middle East’s menu, but usually it’s kibbe or kibbeh). 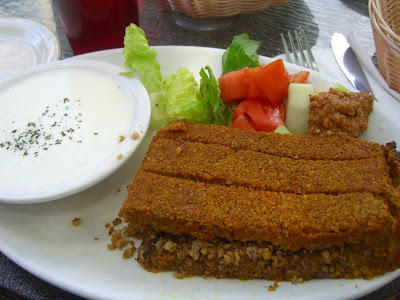 Light while still being filling, pumpkin kibby consists of two layers of ground pumpkin and cracked wheat with a center of pine nuts, walnuts, onions and spices. The yogurt served on the side moistens the kibby and provides a needed tangy note. 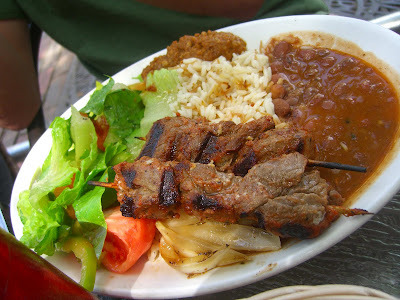 My buddy Fred had the grilled lamb kebabs with grilled tomatoes, onions, and peppers. I’m one of those people who love it when everything on her plate mixes and mingles and schlops together, so I really dig the way the beans run into the rice runs into the veggies run into the salad. 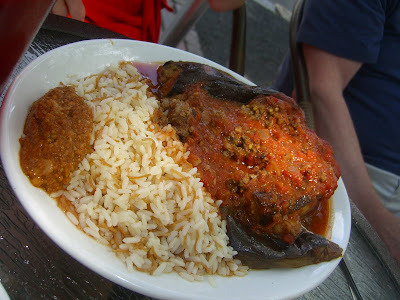 The eggplant stuffed with meat, pine nuts, onions, and spices in a tomato sauce (sheikil mihshi) ordered by my friend Emily is extremely hearty and filling. I used to order it for dinner, balancing it on my lap during the bus ride home. If there’s one place I went to for lunch more than the Middle East, it is Picante. This tiny Mexican joint is just a few doors down from my old office and I don’t think it’s an exaggeration to say I’ve tried everything on their menu. 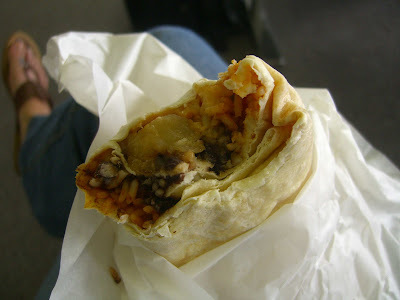 The one item I often crave is the burrito de papas – floury potatoes and onions stewed in a tomato sauce and wrapped up all cozy with rice, black beans, sour cream and guacamole. I’ve often attempted to recreate it at home, to unsuccessful results, so the only way to get my burrito de papas fix is at Picante!